If the Gaming Gods’ prophecies hold true, Rashad Evans (Pictured) will beat Phil Davis via knockout this Saturday at “UFC on FOX.” In a “UFC Undisputed 3” video game simulation between the light heavyweights, Davis attempts to block Evans’ knee with his face and ends up planking on the canvas for his troubles. Evans’ overall rating in the game is 89, while Davis checks in just behind at 88. Coincidentally, Evans is a -185 odds-on favorite to hand “Mr. Wonderful” his first professional blemish. Davis is pegged as a +150 underdog. 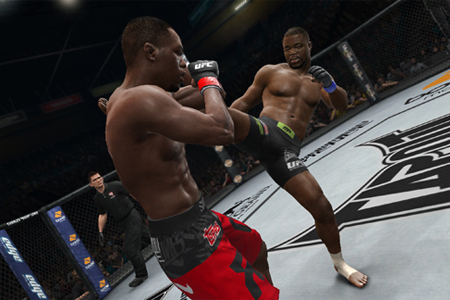 “UFC Undisputed 3″ will be available for the XBox 360 and PlayStation3 consoles. The game is scheduled to hit shelves on February 14th, just in time for Valentine’ Day. “UFC on FOX: Evans vs. Davis” takes place inside United Center in Chicago, Illinois. FOX will broadcast the main bouts live beginning at 8PM ET/5PM PT.